From D. L Asliman's Introduction toAesop's Fables "Don't count your chickens before they are hatched!" "He is a wolf in sheep's clothing." "She has a sour-grapes attitude." "They are killing the goose that laid the golden eggs." "He demands the lion's share." "Don't be like the boy who called 'wolf!'" These expressions are so much a part of our everyday language and culture that they seem to have been with us forever, and that is almost the case, for the fables that produced these proverbial sayings are indeed even older than (to name but three) the modern English, French, and German languages where today they are so much at home. The fables behind these sayings are those of arguably the most famous storyteller of all time, the legendary Aesop. Who was the man who created these timeless literary gems? The Man Aesop Aesop (sometimes spelled AEsop, AEsopus, Esop, Esope, or--using the Greek form of his name--Aisopos) has been known in history and in legend since the fifth century b.c., or earlier, as a gifted Greek storyteller and the author of the world's best-known collection of fables. However, it cannot be proven with any degree of certainty that he existed as a real person. Most modern scholars believe that Aesop was instead a name invented, already in antiquity, to provide attribution for a body of oral tales whose true authors were a number of anonymous storytellers. Martin Luther expressed this view some 500 years ago: "Attributing these stories to Aesop is, in my opinion, itself a fiction. Perhaps there has never been on earth a man by the name of Aesop" (quoted in Jacobs,History of the Aesopic Fabl, p. 15; see "For Further Reading"). Although it is possible that there was indeed a gifted Greek storyteller by the name of Aesop, his reputation expanded to legendary proportions in the decades and centuries following his death, and with time many more stories and deeds were credited to him than he could have composed and performed. Supporting this view, many of the earliest references to the stories of Aesop refer to Aesopic (or Aesopian) fables rather than Aesop's fables. In other words, Aesopic, an adjective, describes a kind of story and a literary tradition but does not claim to identify a specific author. One thing is certain: Aesop, if he existed at all, did not leave behind a collection of written fables. His reputation is that of an oral storyteller, not an author of written literature. The oldest references to his fables refer to tales memorized and retold, not written and read. For example, from Aristophanes's comedyWasps(written in 422 b.c.) we learn that telling anecdotes and comic stories in the style of Aesop was common entertainment at banquets in ancient Athens. More seriously, in 360 b.c. Plato recorded in his dialogPhaedo(section 61b) that Socrates, under sentence of death in prison, diverted himself by reformulating some of Aesop's fables. Plato's Phaedo quotes Socrates himself: "I took some fables of Aesop, which I had ready at hand and knew, and turned them into verse." The doomed philosopher did not have a book or manuscript of Aesop's fables in prison with him, if such a book or manuscript even existed at the time. He knew the fables from memory, as did the partygoers in Aristophanes's comedy. The most frequently cited ancient reference to the man Aesop is found in theHistoryof the Greco-Persian Wars written by the Greek historian Herodotus about 425 b.c. 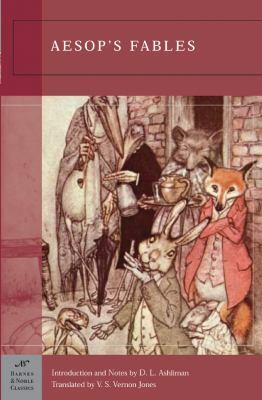 Here we learn that Aesop, the fable writer, was a slave of Iadmon, son of Hephaestopolis, a Samian,Ashliman, D. L. is the author of 'Aesop's Fables', published 2003 under ISBN 9781593080624 and ISBN 159308062X. Loading marketplace prices 39 copies from $0.30 How does the rental process work?